You may have discovered Architecture in Development (AiD) with great enthusiasm, posted on our platform, and/or enjoyed reading our content. You may be interested in some of the practices across the field of architecture and development, and want to further develop your knowledge and network in this field. Since the founding of AiD, we have been welcoming young and experienced professionals alike. We want to make AiD a great place for people like you to collaborate on architecture and create social impact together. To better understand how to make our platform really work for you, we have recently invited you to share thoughts and wishes about AiD and grassroots practices. First of all, we’d like to express our gratitude to all of you who participated in our survey. 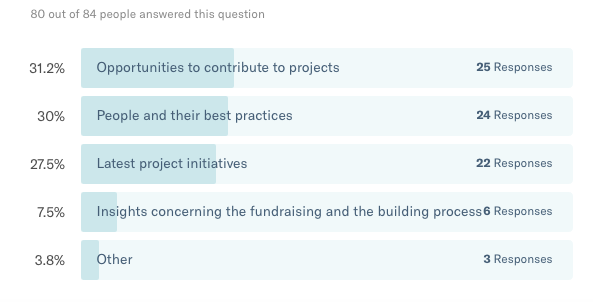 Having collected the results, we now invite you to read what people have said about the challenges a grassroots initiative could face, and what AiD can do to address these challenges. Q1: What's your most important source of gathering information? 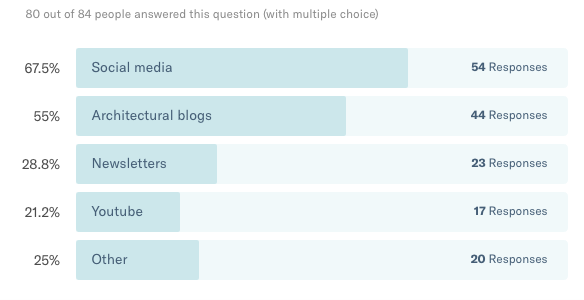 The answers show that social media and blogs are the obvious major channels. Online searches and word of mouth are important sources, too. Youtube, as an emerging media channel, is not yet an important source of information for our community members. Q2: What type of information are you most interested in? Most of our community members are interested in opportunities to contribute to projects. In the coming years, our goal is to provide more access to project collaboration. Q3: According to you, what is the biggest challenge in realising a grassroots initiative? Fundraising is clearly the biggest challenge facing a grassroots initiative. Raising awareness, communication and coordination are also major challenges. Q4: What (or who) can help overcome these challenges? 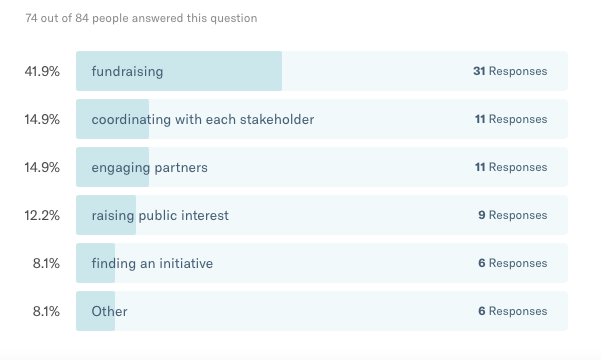 A lot of answers suggest that connecting to the right partners (such as funders, or important organisations with resources) is crucial to overcome the aforementioned challenges. Many directly suggest a 'platform' as a solution. "more campaign or exposure to the user." "open, developed platform to communicate with other interested." "create links between different actors." "working with a locally established partner." "engagement with various stakeholders - government, academia, private sector, and most importantly, community members." "clear communication between all parties." "a platform that connects partners according to mutual interests and goals." "more clarity on channels of Funding options available already, before proceeding to raise funds by unconventional means (crowd-funding etc)." "effective networking and communication + more funds specifically allocated to architecture/urbanism grassroots projects + being visible in the architecture schools - not only US and UK please :)"
"governments, commercial organisations, people who have something to give." "Platform that does 2 tasks: Firstly, it needs to promote humanitarian projects to potential sponsors and collaborators. Secondly, it needs to promote funding opportunities that can be applied for." "Collaboration in the projects and promotion via various platforms..newspapers, radio (to mobilise locals), local tv ads and social media for international support. " "increased trust in the design process." Q5: what AiD can do for you? A lot of answers suggest that promotion and network connections are very much needed in the practice of grassroots architecture. We can't agree more and are working to create a platform to facilitate communication and collaboration among various stakeholders! There are lots of great ideas and we'd like to share them with more people! From February on, we will share one selected comment every week. 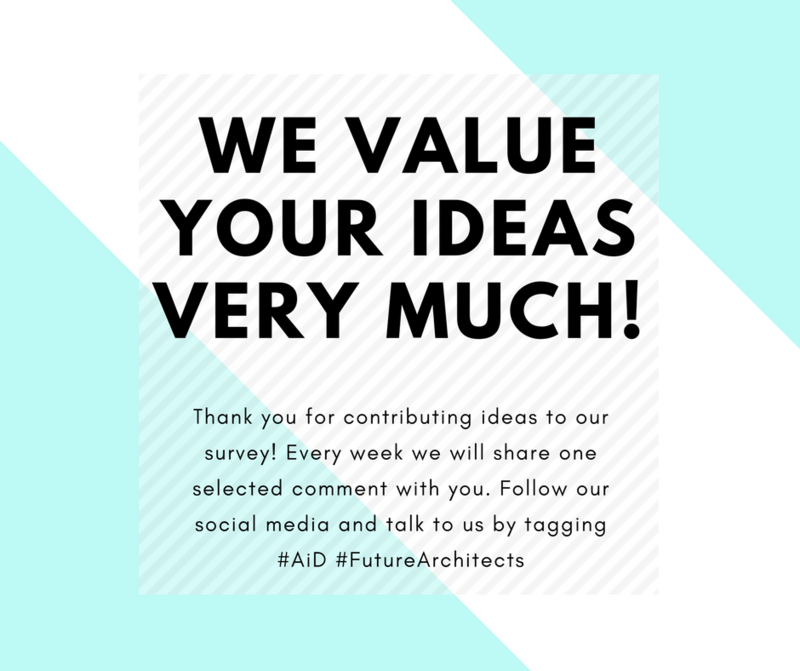 Follow our social media and talk to us by tagging #AiD #FutureArchitects. Talk to you soon!